Scopes are great accessories to mount on a rifle. A good quality scope will boost your confidence; you will be able to aim at targets at a far distance accurately. The Aimpoint pro vs Vortex Strikefire 2 are the two heavy-weights scopes in the world of optics. Aimpoint is popular with the red dots they invented. Vortex, on the other hand, has a huge variety of optics such as red dots and spotting scopes. The two scopes are good quality. So let’s take a dive in their offerings to see which one among them is superior. There are certain things you must consider before making final decision to buy a scope. Whether you are going to the Aimpoint or Vortex, you still need to know these factors to be able to make the right selection. Since you are spending your hard earned money on the accessory, you have to be sure it meets your standard and offer great value for the money. There is a saying that you get what you are paying for but ensure the optic isn’t that bad of a quality even though it is a budget scope. You can get good quality budget scopes on the market, so research carefully before making your final choice. How do you determine a durable scope when you haven’t used it yourself? It is very simple. You can tell if the scope is going to last for a long time or go bad after a couple of uses. You should buy scopes that are rugged, tough and capable of withstanding any environmental condition. Choose scopes that are built from good quality materials which can be either magnesium or aluminum. A scope that is waterproof also comes in handy whenever you eventually find yourself in a wet environment or the rain starts falling. Find out if the scope is pretty easy to adjust, setup or use. Like Vortex Strikefire 2 vs Aimpoint pro which is much easier to adjust or use? You might not have much time to adjust your scope with tools when you are out on the field. Check the turret to see if you can turn it easily. The Aimpoint Pro produces a good quality budget scope that is suitable for quite a lot of shooting activities. The scope is waterproof, but should not be used underwater beyond 150 feet. The scope’s rugged construction is a big plus. It can handle rough use or even a beating that the rifle may not take. It is built with anodized aluminum alloy housing that is very hard. In fact, the Aimpoint is capable of surviving the most demanding of hunting conditions. The Aimpoint Pro is a red dot as compared to the Strikefire 2 that is both red and green dot. So if you are looking for a red dot-only scope, then the Aimpoint Pro is an ideal option. The scope is always combat ready and can remain turned on for up to 3 years with a single battery. The Aimpoint Pro is also compatible with all night vision accessories. It is also designed with rear and front transparent covers to help keep the lenses clean and free from regular cleaning. You can also use the scope in an emergency situation with both transparent covers closed completely. Also, the Aimpoint Pro is very easy to install and comes with a QRP2 rail grabber mount. All you need is to snap the knob three times to have it mounted perfectly. 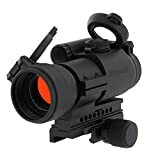 If you are looking for a scope that is combat ready and that will always remain on for your AR15 then grab this scope. It also has 10 brightness settings and with a very durable battery. The Strikefire is another great scope maker. The company produces good quality and budget-friendly scope. It has the 0-ring seals that help to prevent moisture, dust and other forms of debris from gaining access to the scope. This also makes it function well in all environments whether wet or dry. The Strikefire 2 comes with an auto-shutdown feature which the Aimpoint doesn’t have. It will shut down automatically if it stays idle for 12 hours in order to maximize battery life. At maximum brightness and constant use, the battery can last for about 300 hours but in minimum brightness settings, you can enjoy battery life of 6000 hours. Looking at the weight of both scopes, the Striker is less bulky and lighter. The Strikefire 2 is more compact and lightweight. It is well constructed but doesn’t look as rugged as the Aimpoint Pro. The Strikefire 2 is built with good quality material and can withstand recoil and impact from more powerful rifles. The Strikefire is also pretty easy to install and holds zero well like the Aimpoint. Both have crisp clear optics and precise dot. The Strikefire 2 also has lens covers but not like the one on the Aimpoint that is transparent. Between the Aimpoint vs Vortex the winner in terms of budget is Vortex. Vortex also has excellent customer service and warranty. Aimpoint, on the other hand, have been tested multiple times for durability and reliability. The product is much more durable and reliable than the Vortex. So if you are more concerned about durability, then Aimpoint is the ideal option.